Contents include the standard 50 kit with the addition of:2 X 500ml eyewash. 2 X Foil Emergency Blankets. 1 X Mouth to Mouth Airway. 1 X Scissors. 1 X Adhesive Tape. Clinical Waste Bags. Polythene Aprons. In wall mounting lockable (2 keys supplied) metal cabinet. 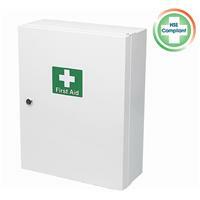 This high specification kit is suitable for construction sites, chemical sites and sites with dangerous machinery. Safety Services Direct is an online health and safety retailer, offering H&S equipment and training courses including UKATA Asbestos Awareness Training. We supply a high-quality and safety compliant product range at competitive prices including: personal protective equipment, health and safety signs and posters. Our health and safety training courses are fully accredited and can be taken online with instant certification. These include: working at heights training, online asbestos courses, manual handling course, abrasive wheels course and much more. We truly are your one-stop shop for all workplace health and safety needs.